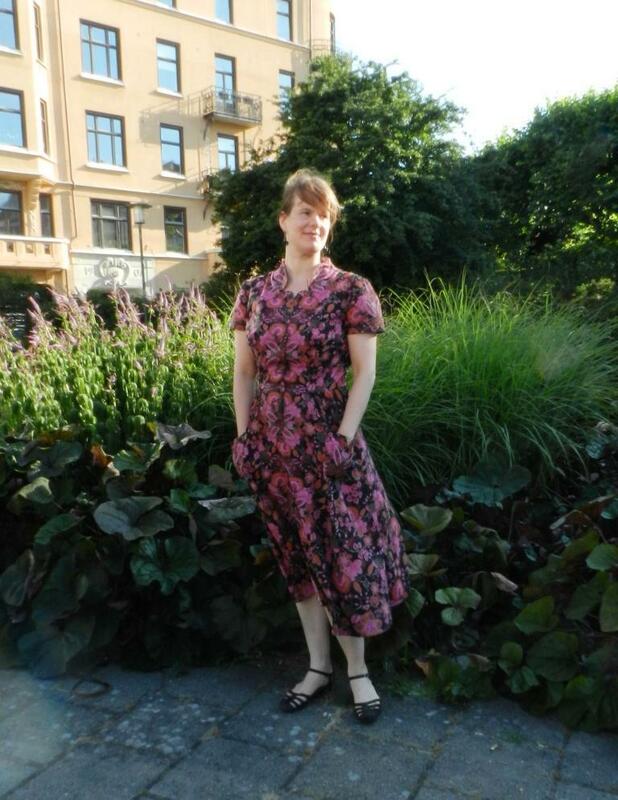 Earlier this year, Butterick had a sale, which prompted me to order several of the Retro Style patterns that I had been dreaming of making ever since I first came across them a couple of years ago. 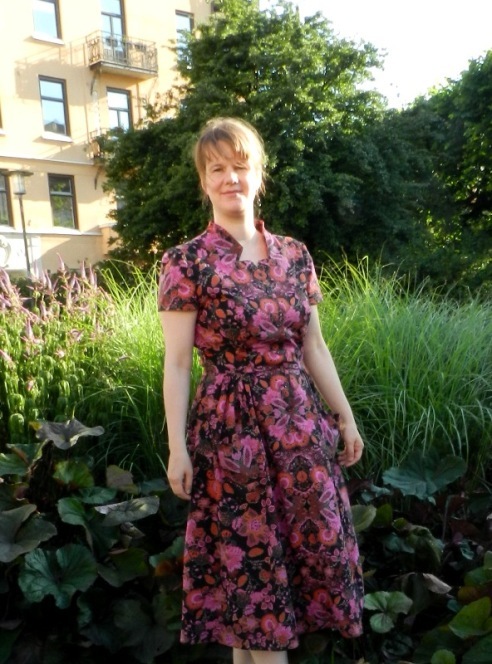 Having stuff sent from the USA to Sweden is expensive, so to make the most out of the shipping costs I ended up buying seven patterns: five patterns for dresses, one for a swimsuit and one for a coat. Outdoor pictures! 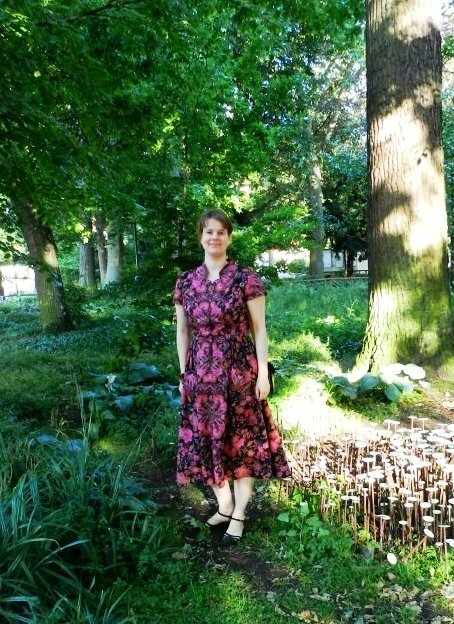 Due to this year’s chilly spring and summer I wasn’t very motivated to finish this dress. Fortunately, we managed to take some pictures outside yesterday before the chilly weather returned. 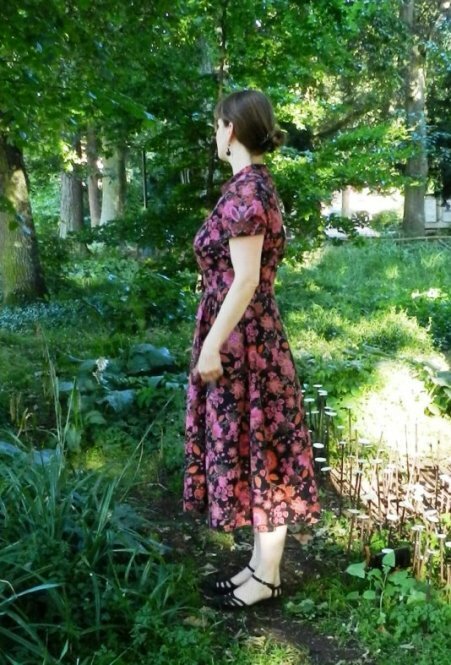 Butterick 5920 seemed like a good pattern to try out first, as I wanted to make a comfortable summer dress that would not be too complicated to put together. At the same time it has some nice vintage details that are not usually seen in today’s fashion. I was particularly drawn to the neckline with the triangular indents. This was my first time working with a pattern from an American pattern company, so I was curious to see how the sizing would work out. After making a muslin in size 16, I lengthened the bodice with 2-3cm and also did my first Full Bust Adjustment. One of the reasons I’ve rarely sewn dresses in the past is because I convinced myself it would take too much time to make them fit. Turns out it was not that difficult and definitely worth the trouble! I added a side-dart so I would not end up with one giant waist-dart. The only thing I am not so happy about is the shape of the darts: I accidently straightened them out during the FBA-process so they look at bit stiff. Well, at least there is barely any gaping or pulling at the bust, which feels much more comfortable than what I am used to in shop-bought dresses and blouses. 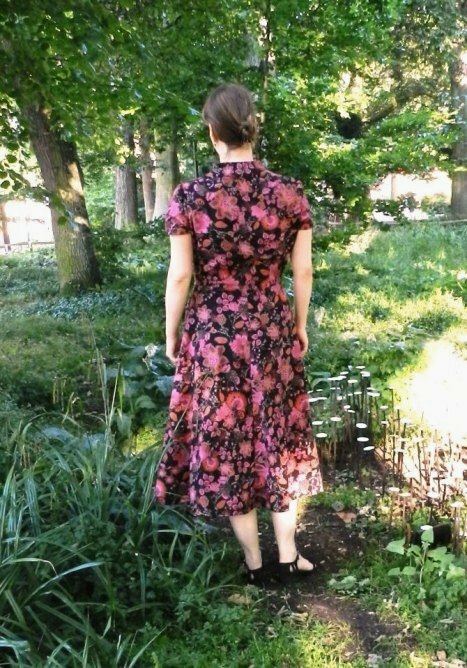 Initially I had wanted to use one of my vintage summer cottons for the dress, but as it turned out all fabrics I managed to locate were too short. 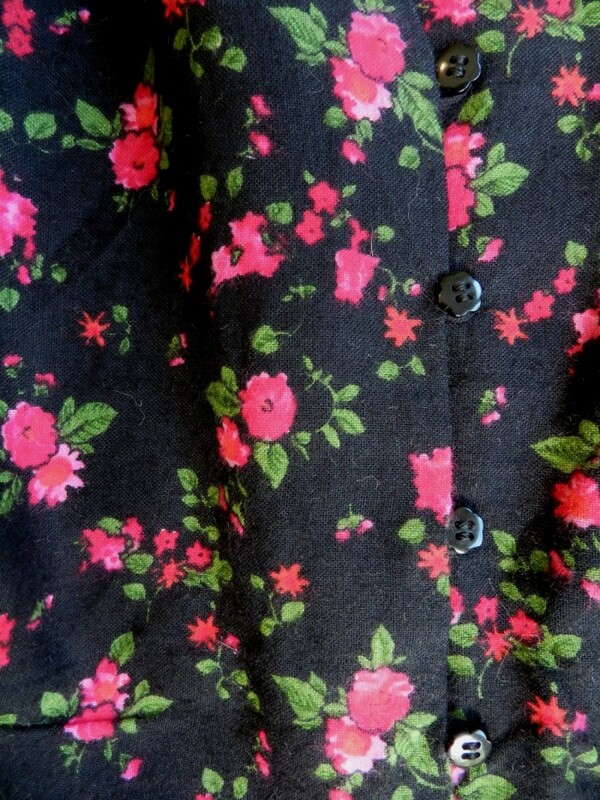 I then chose a lightweight printed cotton that I bought in the autumn sale. Although the fabric was 3 meters long, which should have been more than enough, it took me a long time to cut out the pattern pieces, as I decided not to use the border print that included solid stripes. 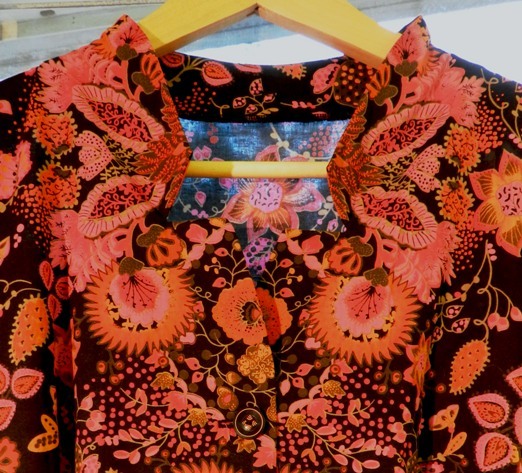 Detail of the neckline with the cut-out triangles. 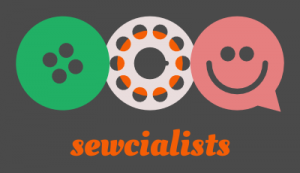 The vintage buttons also have some kind of triangular motifs. In addition, the main panel of the fabric contained a border of floral motifs and due to the irregular repeat it took a lot of measuring to make them match. I was forced to take some width out of the back skirt to make it fit the fabric, but I think that is hardly noticeable. Although I like how the pattern-placement turned out along the neckline, I may have gotten a bit carried away with trying to match the floral motifs on the front bodice and especially the front skirt. I hope that the flower medaillons thus created don’t remind too much of an ultrasound or Rorschach test. 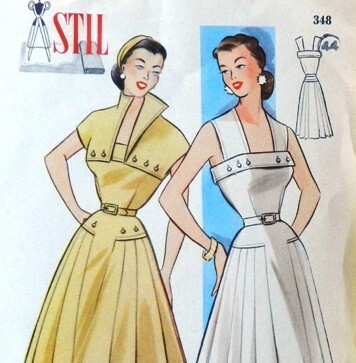 What I don’t like about the pattern is the drafting of the sleeve. It is practically symmetrical, which probably explains why the sleeve fits a too tightly around my arm. I also thought the lenght of the sleeve made the dress look dowdy, so I shortenend it quite a bit. If I were to make it again I would probably go for kimono sleeves, as seen in Mode de Lis’ version. In fact, it was her fantastic rendering of the dress that made me want to get the pattern in the first place! Following her example I placed the pockets on the skirt instead of the bodice, which I think also works better with the flower motifs on my pockets. It just feels right to stand around with my hands in my pockets all the time. That’s how comfortable this dress is. Overall, this was an uncomplicated pattern to put together, although I did manage to make a rather silly mistake: after setting in one of the sleeves, examining it and concluding that it looked smooth enough without considerable puckering I discovered I had set it in upside down! Not the most disastrous thing that could have happened and it was easily fixed, but I did loose my sewing confidence for a moment. Anyway, I think I will make this pattern again in the future, perhaps in black lace or eyelet. 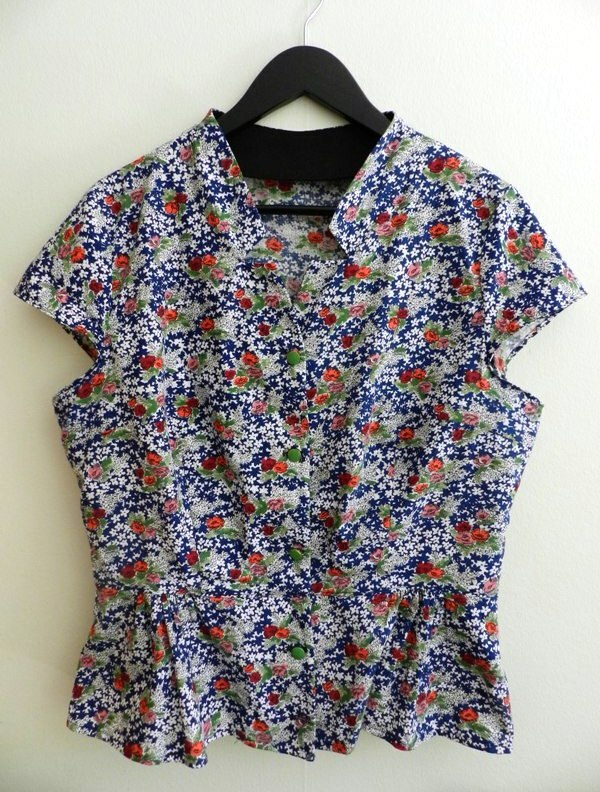 In fact, I have already used it again for a peplum top. A very versatile pattern indeed! I think it looks great! I am going to get a copy of this pattern and try it out. Thanks for the great write-up. Thank you, Catherine! 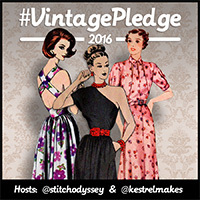 I can really recommend the pattern and am curious to hear how your dress turns out. Thank you! I totally agree with you on the cut-outs, everytime I see a pattern that has them, I immediately want to make it. The fabric I bought online, so I was a bit worried about its structure. As it turned out it does not only look pretty, but also feels very soft and does not need much ironing, so I guess I got lucky there!